Welcome back, stamping friend! I hope you’ll join me in this week’s Sketch Challenge with the Paper Craft Crew! With a sketch challenge, you are free to change the shapes shown, or flip the sketch upside down or sideways. As long as the basic elements remain the same, you’re creativity is the boss! I decided that my shapes wouldn’t be circles (or images within circles), but rather snowflakes! I love how the blues give the ‘cold’ feeling, while the snowflakes and rhinestones add the shine! The card base is Dapper Denim cardstock, measuring 8 1/2″ x 5 1/2″, scored and folded at 4 1/4″. Next is a panel of Color Theory Designer Series Paper – the blue ‘crackle’ look. The next layer of Dapper Denim cardstock measures 3 1/2″ x 5 1/4″. 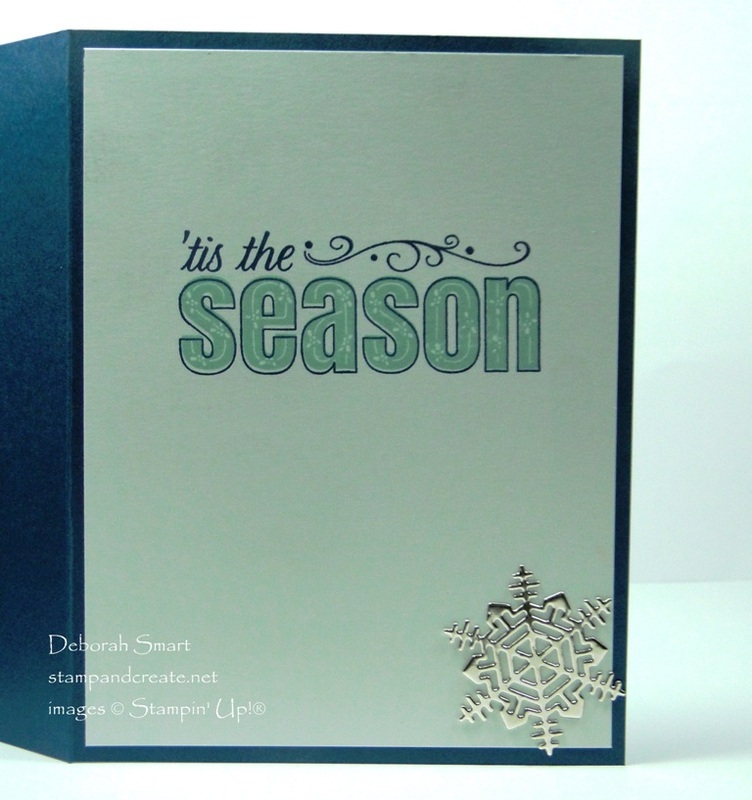 Use the Big Shot with the Seasonal Layers Thinlits Dies to die cut the snowflakes. The large and 1 small snowflake are cut from Dazzling Diamonds Glimmer Paper; the 2nd small one is die cut from the new Champagne Foil Sheets, found in the Holiday Catalogue. I attached the glimmer snowflakes with Multipurpose Liquid Glue. The sentiment is from the exclusive Merry Patterns stamp set (you can only get when your order totals $375 or more), stamped in Dapper Denim ink onto Whisper White cardstock. I used my Paper Snips to cut the banner tails. To give the banner some shape, I gently curved it with my Bone Folder. After attaching it over the large snowflake, with Dimensionals, the foil snowflake is attached with Mini Glue Dots. Finally, I added the Rhinestones to the card front, as per the sketch. I die cut an extra large snowflake from the Champagne Foil Sheet, and added it to the bottom of the inside. The sentiment is stamped in Pool Party and Dapper Denim ink. It’s from the exclusive Merry Patterns stamp set – it’s a great set, so if you can hold a party, or put in an order of $375 or more before Oct. 31st, you’ll receive it for free! I can’t wait to see what you create! For more inspiration and to get the link, visit our Paper Craft Crew challenge page. I’ll be looking for your card! Click the images below to order the supplies I used to create this card. Or for general browsing, click on my signature. My online store is open 24/7, so you can shop when it’s convenient for you! Previous Previous post: A Couple of Reminders for You! Very cute card, Deborah. Thanks for the reminder to stamp inside. I always forget!